Tesco are usually known for their cheap food prices and discounted fuel here in the UK, together with their mobile phones and gadget resales, but it seems the supermarket chain isn’t content with selling other peoples gadgets and have announced their own Tesco Hudl. The Tesco Hudl is due to launch on September 30th and has taken a leaf right out of the Nexus 7’s book, being priced at a competitive £119. The Tesco Hudl features a 7-inch display with a 1440 x 900 pixel resolution, a quad-core 1.5GHz processor, stock Android Jelly Bean 4.2.2, and a Micro-SD card slot with up to 32GB of Storage. Tesco is encouraging users into their ecosystem, more specifically Blinkbox – an online on-demand video and music streaming service where you can buy and rent TV shows and Movies. The Tesco Hudl is somewhat on the thicker side and is made of a plastic material, but Tesco insist it is not just a rebrand, and they worked directly with the manufacturer and spec’d it to their own design. 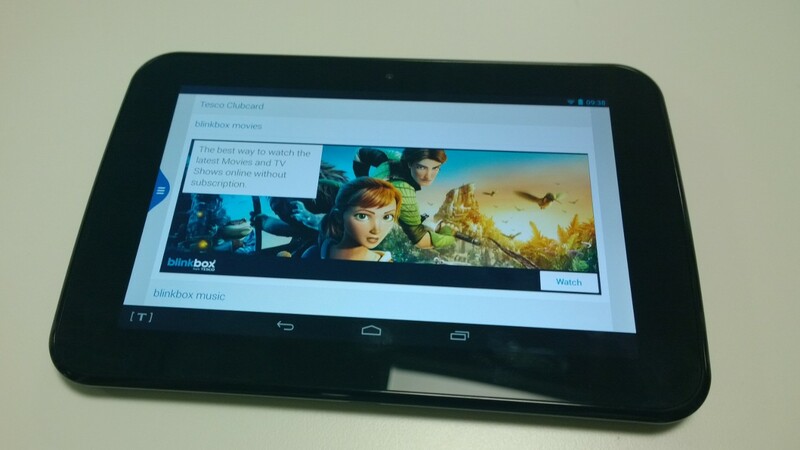 Tesco say the Hudl features an unskinned version of Android Jelly Bean, meaning it should get updates pretty sharpish. Although there is a [T] icon in the bottom left of the screen which gives quick access to Tesco’s online services, which looks like some customisation to me – whether that will result in any delay for updates remains to be seen. Tesco says it will offer double rewards on ClubCard vouchers, allowing customers to get the device for free if they have enough points for a £60 voucher and they say there’s also an offer coming up on Blinkbox to help boost the adoption of the Tesco Hudl. Overall it looks like a solid tablet priced at an affordable price point. I can see with this stuck in Tesco Stores with the right marketing selling like hot cakes.